Heart of the Story: This Edomite killed 85 priests of Yahweh as well as every individual (women, children, babies) in the town of Nob. Back Story: Doeg was an Edomite. Edom was southeast of Judah in land now in Southern Jordan. The Edomites were offspring of Esau, Jacob’s (Israel) twin brother. Doeg was the head herdsman for King Saul. After Saul began to pursue David attempting to kill David, David went to Nob and met with Abimelech. Abimelech was the head priest at Nob, but, had no knowledge that King Saul was pursuing David. Abimelech knew that David was Saul son-in-law and believe that David was the head of Saul’s body guard. When David met with the priest Abimelech, the priest in inquired of the LORD for David, and David and his men food. 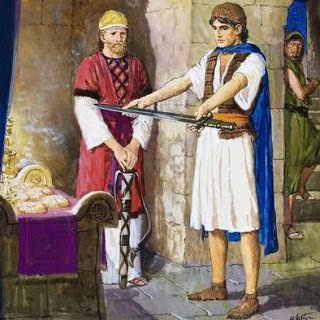 Also, Abimelech gave David sword of Goliath the Philistine which was in the synagogue over which Abimelech presided. Doeg was at Nob and saw how Abimelech assisted David. Doeg took the information to King Saul. Story Line: King Saul was furious when he learned from Doeg that Abimelech assisted David. King Saul ordered all the priests of Nob to appear before them. Saul asked Abimelech and the 85 other priests why they assisted David. Abimelech responded honestly, admitting what he did for David. His reason was the David was honorable and Saul’s son in law. King Saul was incensed and ordered his footmen (personal guard present) to kill the priests. The guard refused to kill the priests of God. Then, King Saul ordered Doeg to kill the priests. Doeg killed all 85 priests. Further, Doeg went to Nob, the town of the priests, and killed all men, women, children. He also killed all animals in the town. Pondering Relationships: Doeg painted the priests of Nob as assisting David who King Saul labeled an insurgent rather than an innocent fugitive. Doeg misrepresented to Saul, Abimelech’s motives for assisting David. In this account Abimelech seemed innocent of willful conspiring with David against King Saul. 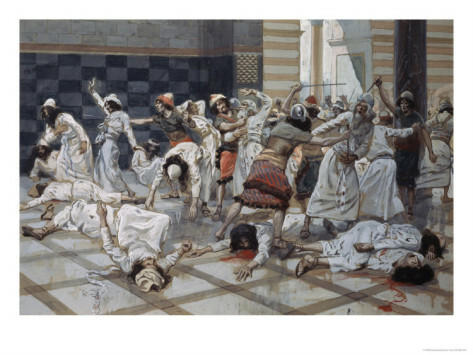 Why did Doeg misrepresent the truth to King Saul and why was he willing to go on a killing spree against the priests of Nob and their entire town including innocent children and animals? Where did all Doeg’s rage come from? I can think of two places. Perhaps the rage went back 800 plus years when Jacob, patriarch of the Israelites, stole Esau’s birthright from him. Ancestral memory and stories seem to have a life of their own. Let me give you an example: I was reared in Pennsylvania on stories of the Revolutionary War. Despite the intervening almost 300 years and the fact that Great Britain is now a close ally of the United States, I still have resentment in my heart for England. Often emotions are fueled by folk stores and not based in logic. The gods of Edom were different from Yahweh, the God of Israel. Perhaps, Doeg believed that he was supporting his god when he killed priests of Yahweh. Psalm 52 was written by David. It describes his anguish over Doeg’s evil, dastardly actions. Reflection: Can you think of other reasons why Doeg acted as he did? Copyright 10/12/2018; Carolyn A. Roth. All rights reserved. This entry was posted in Kings & Rulers, Military Captains & Commanders, Priests and tagged Bible characters, Doeg the Edomite, King Saul, Priest Abimelech, Sword of Golaith. Bookmark the permalink.